I like this picture, because it is a collection of faces…that become Troy Davis. Executed on the 21st day of September, 2011 at 11:08pm…in spite of overwhelming reason of doubt…the state of Georgia still rejected the stay of execution and took this man’s life. Let me state here…this won’t be a blog full of legalese, dripping with political terms and agenda. There will be no recounting of the evidence or lack thereof throughout the trial. I’m not here to run down the precedents, the list of witnesses or even Troy’s background of criminal activity before his subsequent arrest for the murder of Officer McPhail. What this is…is a woman trying to make sense of the senseless. Someone trying to remember that God’s will is by far vaster than anything we can dare conceive. How it is that a 16yr old, held and tried on flimsy evidence…and eventually…recanted stories…is sad. It could’ve been my cousin, my uncle, my dad, my friend…it could be them still. Yet, this isn’t about the many men who Troy symbolizes…or even the many women who have lost their sons to the system. It’s about a sleep-walking creature called Racism. I say sleep-walking, because it’s not sleep…and it’s not quite conscious. It’s alive. It’s breathing. It’s quite possibly…even infectious. It’s surely not dead. It did NOT die with MLK, Malcolm, Medgar, Marcus, Rosa anem. It wasn’t even remotely subdued by Huey, Angela, Bobby, Assata anem. Yet it’s not conscious anymore. ^^^That…a “systematic” thing…so commonplace and banal in repetition…that eventually becomes subconscious. It is second nature to those who made the “ism” of racial inequality…their practice. What this looks like to me is a very loud and resounding cackle in the face of America’s people who thought that with the election of our first Black president, things would change. The hope was beautiful, the dream was glistening…bright like angel eyes…but, decidedly unrealistic. How it is that in the face of stories changed, reports of police coercion and others confessing…that they’d still take the life of a man, whose journey to injustice began as a child? I don’t know…seems like that beautiful dream died an egregious death. 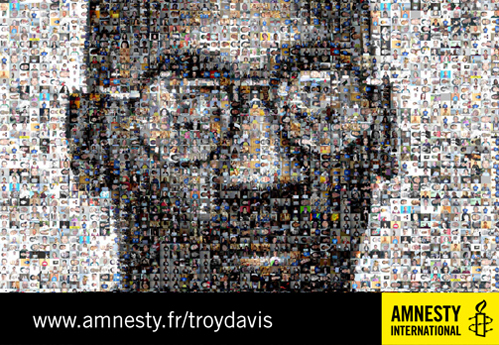 What was beautiful…was seeing so many different colors blur and “become” Troy Davis. The petitions were passed around, the numbers posted were called…the pictures of him were posted for reminders of urgency…and no one cared what the person standing next to them looked like. Rest In Peace, Troy…I pray that your life doesn’t go unaccounted for. I pray that your transcendence leads to a portal of light bright enough to shed light on injustice and blind the holder of those scales…for real.